A simple and affordable FMD solution made by pharmacists. Nothing to install, simple to use and adjustable to fit your existing workflows. PharmScanner will get you FMD-compliant with no minimum term contract. Registration for PharmScanner is now available! Complete this form to arrange your free, no-obligation trial of PharmScanner for your organisation to ensure easy, affordable and hassle-free FMD compliance in time for the February 2019 deadline. Once you have completed the form, we will register you with SecurMed UK (the UK Medicines Verification Organisation) on your behalf, and contact you to explain the next steps. This should be as it appears in the authorising or registration database (e.g. GPhC register of pharmacy premises). Functions include community pharmacy, hospital pharmacy, wholesaler, pre-wholesaler, dispensing doctor and general practitioner. If more than one applies, please mention this. SecurMed UK may send postal correspondence to this name, at the address for your organisation. This person doesn't have to work at this address. Have any questions about the registration process? Contact us and we will be happy to discuss. 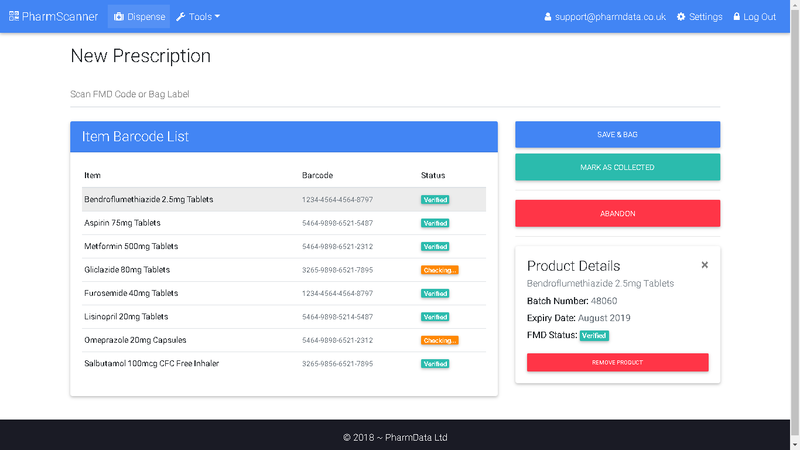 Created by the PharmData team, PharmScanner is a simple to use and affordable FMD solution for pharmacies, clinics, wholesalers, hospitals and GP surgeries. Sign up online and become FMD compliant easily and hassle-free. Just £20 per month for pharmacies, dispensing doctors and wholesalers; £10 per month for clinics, hospitals and GP surgeries. 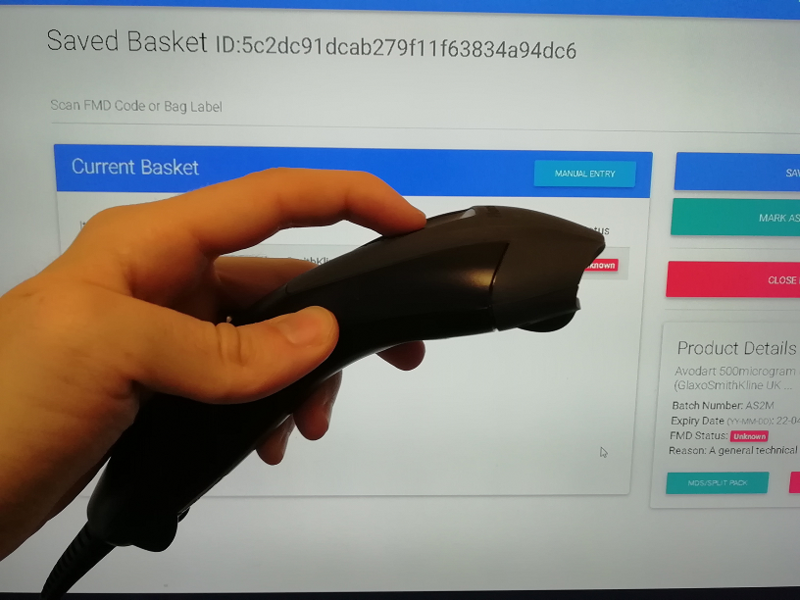 PharmScanner runs on your computer's existing browser, so you don't need any expensive additional hardware or software, other than 2D barcode readers (if you don't have any yet, we can help with that, too!). We can also help you get set up via phone and email, to minimise disruption to your pharmacy. 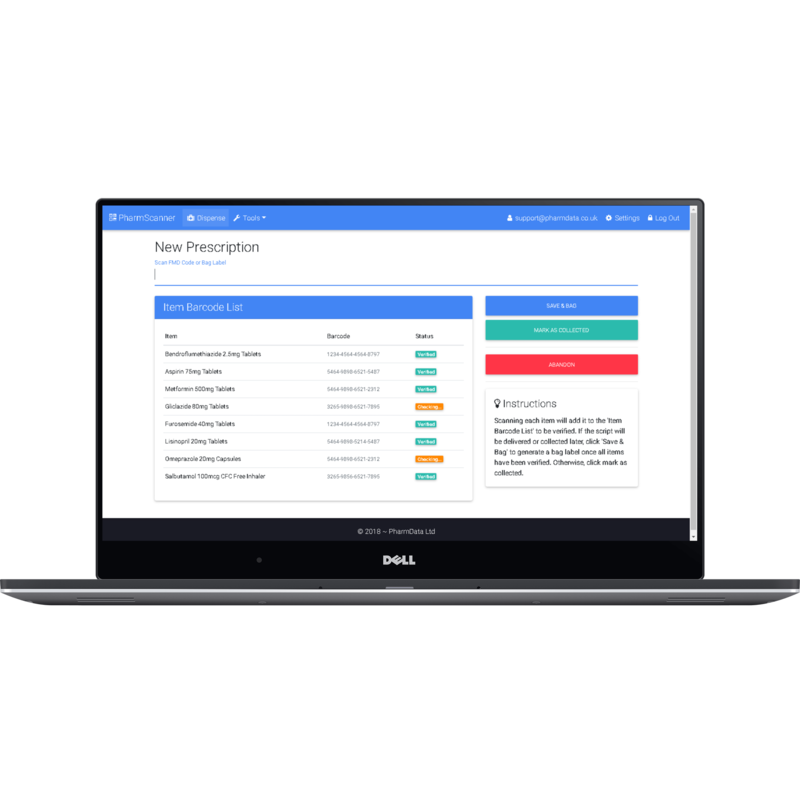 Designed by community pharmacists to minimise any disruption to your existing ways of working, and to be as straightforward to use as possible, PharmScanner can make FMD work for you. Aggregate bag labels and aggregate by EPS tokens to make decommissioning medication at the point of handing out to your patients as simple and fast as possible. As pharmacists, we understand the financial pressures facing community pharmacy, and we're also nice people. That is why PharmScanner costs just £20 per month (discounts are available for groups), and we don't make you sign any minimum term contract. You can stop using PharmScanner at any time without worrying about paying a penalty or a notice period, e.g. in case FMD is no longer required. Watch the video to see how PharmScanner can be used in your pharmacy or organisation. Depending on your existing procedures, you may prefer to integrate PharmScanner in a different way or at a different point in your dispensing or medication handling process - our system works around you, to ensure minimum disruption and maximum efficiency. Simple and affordable pricing that just makes sense. Cancel at any time with no penalties. We don't believe in tying you into contracts, so we don't do it. You can get support from us online or by phone. We provide more than just technical support - we can help you with implementation, SOPs and staff training. If you find a better price for an FMD solution, we will match it. We're driving down the cost of FMD! You shouldn't have to pay until you're sure that PharmScanner is right for you. Sign up now, start using PharmScanner for free and be fully prepared for FMD. A secure encrypted connection to the FMD database (NMVS), plus your data is backed up on a daily basis. PharmScanner just works, and can withstand temporary connection issues to make sure that you are always 100% compliant. Designed by pharmacists, PharmScanner is simple to use for all your staff members, and optimised to be as time-efficient as possible. PharmScanner causes minimal disruption to your workflow, whilst also making your pharmacy or organisation FMD compliant. Adjustable settings help you customise PharmScanner exactly how you want it. Our SOPs are completely free to download, use and adapt as necessary to suit your existing or desired workflow. Make sure to subscribe to the PharmScanner newsletter to get notified of any updates to these SOPs, and please feel free to contact us if you want any clarification or want to see anything added or changed! PharmScanner for pharmacies and dispensing doctors costs just £20 per month. PharmScanner for wholesalers costs just £20 per month. PharmScanner for GP surgeries, clinics or hospitals costs just £10 per month. 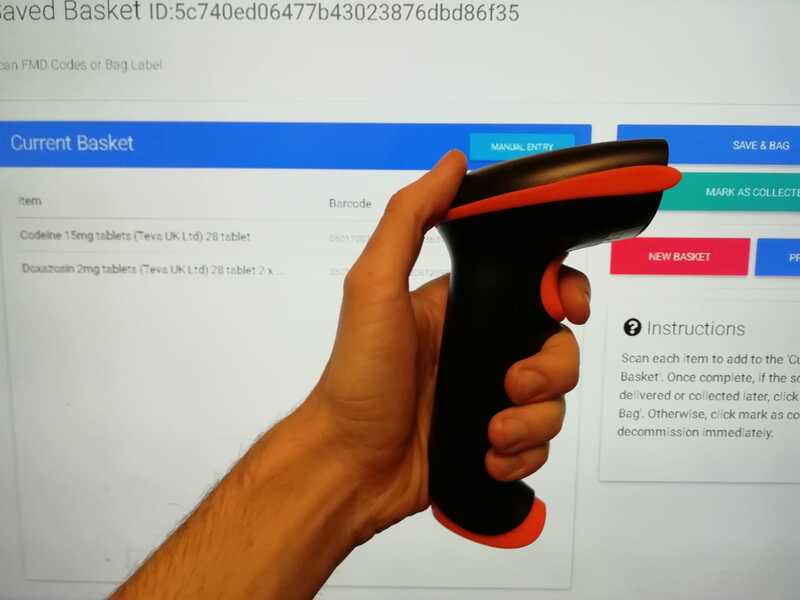 Based on our testing, and taking into account price, ease of use, ease of setup and durability, we can recommend two models of 2D barcode scanners which are fully compatible with PharmScanner. Both of our recommended scanners are able to be plugged into a USB slot on a computer or laptop. We recommend handheld scanners because (compared to desktop, "supermarket-style" scanners) they are better value, take up less of your valuable desk space, and are more maneuverable (especially for when trying to scan multiple packs of medication). If you already have a 2D scanner which is not on this list, or want to discuss other options e.g. wireless scanners, please contact us! Can be used in presentation mode - rather than holding the scanner and pressing the button/trigger to scan boxes, you can rest it in it's stand and present the boxes of medication to it for automatic scanning. Available to purchase for £85.54 each (excluding VAT) from Barcode Warehouse (exclusive discounted rate for PharmScanner customers). Do you have any questions about PharmScanner, FMD, or how you can make FMD fit into your organisation's processes? Contact us and we will be happy to chat with you. Please note: your privacy is important to us, and the details you enter here are used only for the purpose of sending us your message.